We've followed the fortunes of Lefthouse Films and their director Brian McGuire for a few years now and have been lucky enough to review their last two entries at Raindance Film Festival, Window Licker and 1World, 100 Lonely, so it was great news when we heard that their latest film was also getting its World Premiere at Raindance this year. Again written and directed by Brian McGuire, Sick of it All is a black and white noir-style comedy based on the French children's book, The Little Prince written by Antoine de Saint-Exupéry. Sometimes it's hard to tell. And sometimes it takes a child with the wisdom of an adult, to change an adult who is acting like a child. And sometimes the only problem is, the grown up has to listen. And it's hard to listen when you are Sick Of It All. 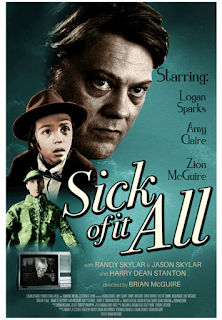 Antony (Logan Sparks) is a stressed out, grown up, toy collector who has lost his youthful ways. Perhaps he lost his vigour through years of telemarketing, or it could be his constant struggle with the modern world. But maybe just maybe it's because he finds himself in a loveless relationship with his lady of ten years, Rose (Amy Claire). Is it time for Antony to grow up and join the new age "sonic healing cult"? Or will he take the sage advice offered by his 7 year old nephew LP (Zion McGuire, Brian's nephew) and find himself again? Find out more about the film and book tickets to see it at Raindance here. We'll have a review for you soon.